These really seem to clump up. And there are a few more to come, but after we get through the P’s it’s smooth sailing until the T’s. I think. When I was four years old, my mother, because she did everything doctors and convention told her to, brought me to the hospital so I could have my tonsils out. I have a few strong recollections of that event. I remember someone had forgotten to pack my slippers and I had to wear hospital slippers made of a kind of cardboard as we were taken down the hall. We were a bunch of little kids kept in this large room where we were stored in cribs lining the four walls. I didn’t know if we were all there for the same reason, but I don’t think I even understood why I was there. That night, before we were to go to sleep, two or three women came into the room. I think there was a nurse and one was a lady doctor because she had a stethoscope around her neck and seemed to be the one in charge. They had a cart which they wheeled from crib to crib and I stood in my crib and watched from the far side of the room as one by one, each child’s finger would be pricked, and each would start to cry as a drop of blood would be placed on a glass slide. But there was tenderness from the women. No annoyance nor impatience. Each child would cry, and each child would stop. Except me. I continued to watch as the lady doctor pricked my finger, and I didn’t cry. I don’t know why not. I just didn’t. They smiled and I thought the lady doctor was pretty. She complimented me for being such a big girl and rather placing a drop of blood on the slide, she took my finger and made a happy face on it with my blood. I next remember lying in my own bed at home. My mother was passing my door with my brother and she stopped and lifted his shirt to show me the spots on his stomach. It was amusing to us all. He had measles. And that’s all I remember. The rest was my mother’s memory. I caught the measles and having just had my tonsils out, got very sick. I had a temperature of 104 and my mother kept me in bed with her, holding me throughout the night. 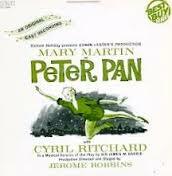 She was scared, but I did recover, and as I did, according to her, I wanted to hear the Peter Pan record over and over. That’s when she started calling me Wendy and singing the Wendy song to me. I do believe that lasted a few years. I did watch the TV special every year and would look to see what would be different this time, and worried that star Mary Martin as Peter may fall as she flew around the stage. Luckily, each year, everything went off without a hitch.